It's that time of year again. Welcome back, fantasy hockey fans! Each year we hope that this is "the" year -- the year you take home that fantasy crown and own bragging rights for the offseason. Whether you're looking to bounce back from a devastating loss last season or looking to defend your title, there's nothing better than the start of the new fantasy season. That year of years starts with the best strategies to build and develop your fantasy league's champion. From draft preparation all the way through in-season trades and the playoffs (for those of you in head-to-head leagues), NHL.com's panel of fantasy hockey experts will be here for you year-round. Let's first take a look at the fantasy hockey league formats and draft types, and then turn to winning strategies for the 2011-12 fantasy hockey season. From the amount of teams in the league to the positions and the scoring, you need to make sure you know everything about your league in order to formulate a draft day strategy. The most common fantasy leagues will consist of these positions: two centers, two left wings, two right wings, four defensemen, two goalies and four bench spots. The scoring categories will usually be made up in a 6-by-4 format (six offensive categories and four goaltending categories): Forward/defenseman categories typically include goals, assists, plus/minus, power-play points, penalty minutes and shots on goal. Goalie categories typically include wins, shutouts, goals-against average and save percentage. Here's a primer on league formats related to how your team wins or loses. Rotisserie league: This is the most common form of fantasy hockey. Fantasy teams are ranked from first to last in each statistical category. Points are then awarded to the top ranked team at each individual category, and then those points are added up to determine the overall standings of the league. The team with the most points at the end of the NHL season wins the league. Head-to-head league: This format allows the league members to face off against each other on a week-to-week basis. Each statistical category counts as a game, and the team that wins the category on the week gets credited with one win. The wins and losses are totaled weekly and then added to a final season record. The teams with the best records then compete in a playoff format to determine the league champion. Points league: Fantasy points are awarded based on how your players perform in each statistical category. All NHL stats have point values, and each player's points are then summed to produce your total for that day. The fantasy team with the most points at the end of the year wins the league. For example, if a player on your team scores a goal, your entire fantasy team is awarded 3 points. If a player gets an assist, your team is awarded 2 points. This format is different than a rotisserie league because the points keep adding up over the course of the season. Standard draft: Teams are assigned a specific draft position and then they select players in that same order throughout the entire draft. Snake draft: This is the most common draft format. Teams are assigned a draft position and then they select the players in order in the first round, and then that order is reversed in the second round, and then reversed again in every round after that. Auction draft: Team owners bid on players using a predetermined budget. This format allows a team to have the ability to "buy" any player at any time during the draft. When preparing for your draft, you will likely confront several dilemmas. What position do you draft in the first round? When do you grab your first goalie? How about your first defenseman? Before answering these questions, you need to pick a strategy and stick to it. Balanced attack: Probably the most common strategy in fantasy hockey; draft your elite players at each position initially, and then reassess how your team looks after the first few rounds. After that, fill up your roster by addressing what statistics you feel your squad needs. All offense: Draft all forwards in the first few rounds. Build your team around scoring and offensive production. Worry about defensemen, goalies and what specific positions you need on your team later in the draft. 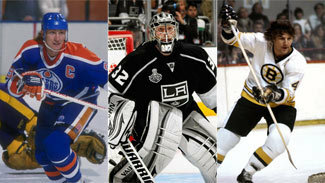 Thinking between the pipes: Draft your two goalie positions in the first two rounds. Build your team around winning the goaltending categories and draft your forwards and defensemen later in the draft. There are usually only a handful of elite goalies, so addressing this position immediately ensures that you've filled up the thinnest position in fantasy hockey. Position scarcity: Select either a defenseman or goaltender in the first round, filling the position with the least amount of elite players available. Continue with that theme throughout the draft by selecting players that may be ranked lower than another, giving you the advantage of filling up the weaker positions. For example, you would draft a defenseman like Phoenix's Keith Yandle ahead of a center like Chicago's Patrick Kane (who would be ranked significantly higher) because you're addressing the position that lacks depth. Best available: Regardless of what positions you need on your roster, you always select the best available player on the draft board. For example, say you've already got the Red Wings' Pavel Datsyuk and the Hurricanes' Eric Staal as your starting centers, you still draft the Kings' Mike Richards with your next pick because he is the best overall player available. This strategy gives fantasy owners the ability of having trade options after the draft. They can then deal a player like Richards to a team that lacks an elite center and possibly make out better in the trade. There are still other strategies out there -- NHL.com invites your comments on the subject -- but these are the most tried-and-true. Plus, once you've decided on which strategy you want to run with on draft day, you can begin to analyze and target the players you want. That's when the fun starts. Good luck to everyone out there and may the best team win!